The challenge the factory set for the creation of the T50 was that it should offer a first-class experience. In every sense. Style. Living space. Performance. And the result speaks for itself. You'll discover a unique approach to improving performance and a design that delivers outstanding responsiveness. We believe this is the most complete 50-footer ever built. But as always, you need to experience it for yourself. 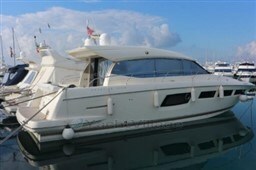 This Sealine T50 has been never really used and, even if built in 2009, she has been delivered new in 2011. British flag, she is the perfect deal. Call for further details. Externally adjustable cockpit sofa-cockpit table and chairs Director-Table lounge Up & Down convertible in double bed-extra fresh water Tank of LTS. 250. Dear Sirs, I have seen on YachtVillage your offer about Sealine Sealine T 50 - 2009 (code: 206507). I am interested in the offer and would like you to contact me. Thank you.